The biggest success story in tech may have nothing to do with iPhones or Facebook news feeds or Amazon Prime subscriptions — instead, it might just be about pizza. 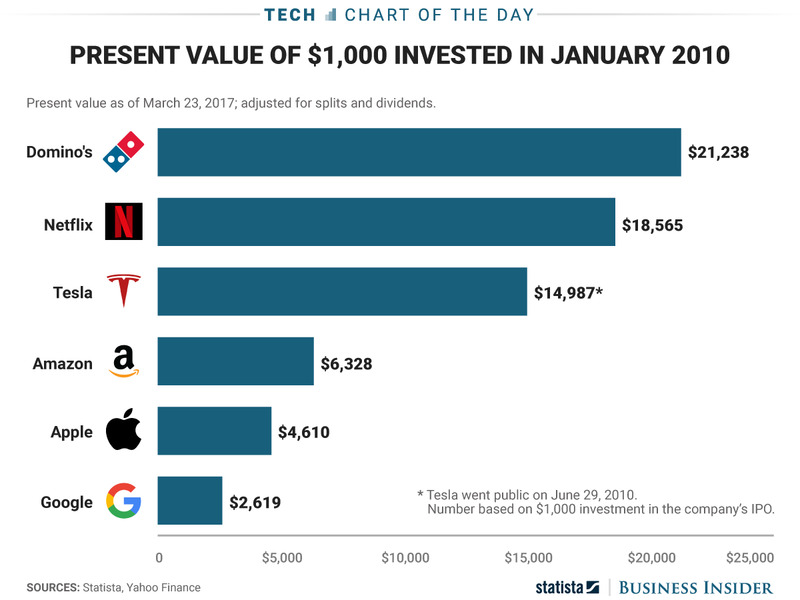 The revival of Domino’s Pizza is well-documented at this point, but this chart from Statista shows just how staggering the company’s success has been over the course of the decade. As Quartz noted earlier this week, Domino’s share price growth has outpaced the most successful tech companies in the world since 2010. Now, part of this is because some of those tech companies were already in a good place when Domino’s started its turnaround. But it still compares favourably to companies like Netflix and Tesla, who have also come to greater prominence over that time. If you’re wondering why we’re talking about pizza in a tech column, much of Domino’s turnaround can be credited to its embrace of modern technology. It improved its actual pizza in 2009, yes, but it’s continually built out its ordering app, rolled out custom delivery cars with built-in ovens, and made it so you can order food with emojis, among other things. It’s all a bit silly, but those who’ve stuck with the company are probably laughing all the way to the bank.